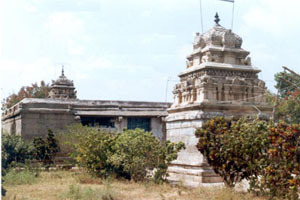 The capital of Adhiyamans, ancient rulers of Tagadur, was Adhiyamankottam which is situated on the Salem-Dharmapuri road at a distance of 7 Km from Dharmapuri. The ruins of the roughly oval shaped fort is still there. The Chenraya Perumal temple is the biggest of the lot which is held as a protected monument which is believed to have been constructed both by the King Krishna Deva Raya and Hoysala Kings. There is a mandapam which leads to the sanctum sanctorium. There are paintings in the ceiling depicting scenes from the Mahabaratham, Viswarupa dharshan of Lord Krishna and some scenes from Ramayana and is still pleasing to the eye. All the paintings are belonging to 13 century. Subramanya Siva was born on 4th October 1884 to Rajam Iyer – Nagalakshmi Ammal in Vathalagundu, Madurai district. He had passion for the nation and Independence right from the age of 12. 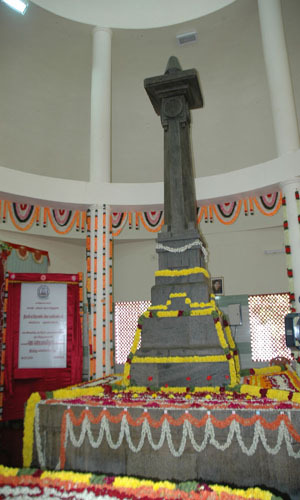 He actively involved in freedom struggle inspired by the speech of Sri Thahurkhan of Arya Samaj in Trivandrum in the year 1906. He inspired many young men to join the freedom movement through his oratory and established “Dharma Paribalana samaj” in Trivandram in the year 1907. So he was quitted from Trivandram. The British Government sentenced 6 years severe imprisonment in 07.07.1908. The relentless freedom fighter and heroic patriot Subramaniya Siva chose Papparapatti village in Pennagaram taluk as the center of activities during his last years of life and took efforts to establish a Bharatasharam in Papparapatti. He published Gnanabanu, a collection of poems and prabanyamithran magazine in which he published Articles on the importance of attaining freedom for India, freedom struggle and the service of the National leaders. He staged labour agitations in Chennai, Kolkatta, Tuticorin, Tirunelveli against British Government. Despite his illness and the severe restriction imposed on him by the British Government, he did a lot in enlightening the people in political matters and introducing order in their public life. He continued to fight for independence and suffered numerous prison terms while serving his last prison term, he was afflicted by leprosy to which he succumbed in 23 July 1925. Hon’ble Chief Minister of Tamil Nadu Selvi J Jayalalithaa inaugurated the memorial of Thyagi Subramaniya Siva constructed at a cost of Rs.40 lakhs in Papparapatti, Dharmapuri District. The Birth Anniversary of Thyagi Subramaniya Siva is celebrated annually on 4th October in Papparapatti, Dharmapuri district by the Government of Tamil Nadu. 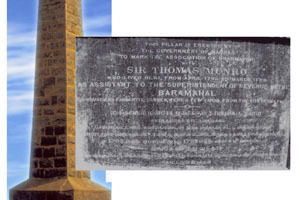 This pillar was erected by the government of Madras to mark the association of Dharmapuri with SIR THOMAS MUNRO who lived here from April 1792 to March 1799 as Assistant to the Superintendent of Revenue in the BARAMAHAL. His house and his favourite garden where few yards away from this place.